Cozi Central helps busy families manage schedules, appointments, shopping and communications from wherever you are — the kitchen, car, office or even the grocery store. Cozi Central is available as a software download and in a Web version. You can view or edit your busy family’s schedules in a central location. Keep track of items to be purchased and tasks that need to be done. Send quick messages to other family members, individually or all at once via phone or email. Enjoy all your digital photos with automatically generated collages that you can easily share with friends and family. Famundo for Families is your family hub, making your family’s schedule manageable and giving you control over your daily life. It offers Family Calendar, Address Book, Message Board and Family Library. If your school, church, and scout troop are using Famundo for Organizations, you can simply visit their site, select the calendar you are interested in and subscribe. You can even designate which family member these events belong to. Stixy is an online bulletin board. You can create as many Stixyboards as you like, one for each project. UseStixy to easily organize and share: your family’s schedule, projects at work, an upcoming holiday, your photos, or share a file or two with a friend. Grouptivity is a web service platform that replaces “email a friend”. Grouptivity provides web publishers visibility over the distributed web content, and monetization opportunities. It provides a significantly better experience for your web visitors to share and discuss web content. Mecanbe lets you create, customize and share Goal-Lists to help advance in any area of life. You can rate your goal performance periodically and view charts of your ongoing progress. Share strategies for success and help empower the rest of the world. LooseStitch lets you create and share outliner documents, brainstorm ideas, jot them down, call friends over, get feedback, and many more. Using LooseStitch is extremely easy. You start out your outlline by adding rows to it. Jot down anything relevant that crosses your mind. You can rearrange and structure your thoughts later. Or delete them if you must. Wamily is a social collaboration application. You can use it for your group, team, family or club organization. Start a Wamily for your group, team, family, club or organization. Keep your Wamily private, make it public, or anywhere in-between. WebOffice makes working together easier. You can share documents, calendars, information, and conduct live meetings from the office or the road. WebOffice brings together powerful, professional web-based business applications specifically designed to make collaboration easy and cost-effective. 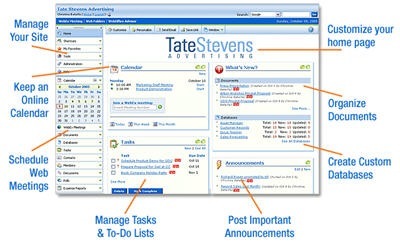 Everything you need to manage your business on the web is together in an integrated, centralized place. Zoho – offers a word processor with collaboration features, spreadsheet, presentation tool to create, edit, publish, and show presentations, wiki writer, notebook, project management, CRM solution, database creator, calendar, web conferencing, email and chat and more. QuickBase.com is flexible online working application. With QuickBase from Intuit, your team finally has an easy way to organize, track and share information – all from a single web site. Watch productivity soar with QuickBase’s customizable online workgroup applications. Zimbra is open source server and client software for messaging and collaboration – email, group calendaring, contacts, and web document management and authoring. The Zimbra server is available for Linux, Mac OS X, appliances, and virtualization platforms. The Zimbra Web 2.0 Ajax client runs on Firefox, Safari, and IE, and features easy integration / mash-ups of web portals, business applications, and VoIP using web services. Joyent is run by, and for, people who love publishing on the Web. Design, develop and deploy applications using our collaboration software, data backup services and on-demand computing solutions. The ease with which Joyent solutions scale to meet increased demand allows startups and developers to focus on growing their business – instead of watching over their servers. Confluence is an enterprise wiki that makes it easy for your team to collaborate and share knowledge. Adding, sharing and finding content has never been easier. These benefits come with all the additional features needed to make it a part of your business: enterprise security, simple installation and management, user-friendly WYSIWYG interface, powerful tools for structuring and searching your wiki, professional features such as PDF export and automated refactoring, and more. Central Desktop is a full work suite for project teams including spreadsheets, file sharing, calendar and more. It was created for business teams, not the IT department. That is why no technical knowledge or programming experience is required. Concept Share allows you to easily share designs inside Workspaces that contain designs related to a certain topic or project. It’s easy to invite people into a workspace. Invite team members, managers, clients, and consultants to add and reply to comments, chat and markup designs. People do not have to be in the workspace at the same time to contribute. Workspace members can log-in anytime to any workspace they are member. If members do happen to be in the workspace at the same time they can collaborate with real-time chat and real-time comment updates and concept updates. Yugma is a free web collaboration service that enables people to instantly connect over the Internet to communicate and share content and ideas using any application or software. Whether you are using Windows, Mac or Linux computer, you can connect on-demand and real-time with co-workers, clients, friends and family — regardless of whether they are across the city, nation or even the globe. Google Docs & Spreadsheets is a free web-based word processing and spreadsheet program that keeps documents current and lets the people you choose update files from their own computers. You can, for example, coordinate your student group’s homework assignments, access your family to-do list from work or home, or collaborate with remote colleagues on a new business plan. Google Docs & Spreadsheets allows you to import your existing documents and spreadsheets, or to create new ones from scratch. You can edit your documents from anywhere. Google Docs & Spreadsheets accepts most popular file formats, including DOC, XLS, ODT, ODS, RTF, CSV, etc. Besides, you can publish your documents and spreadsheets online with one click, as normal-looking web pages, without having to learn anything new. Wrike a leader in on-demand Online Project Management. Wrike helps to save time for marketing agencies, software development teams, event organizers, publishers, financial services firms, process engineering companies and many others. Wrike is a Web application, so you do not need to download or install anything. Our patent-pending technology works with your e-mail client. So you can keep track of tasks with e-mail. Wrike can help you to turn e-mail overload into nice-looking project plans. Vyew is a free online meeting service that brings people and content together. Use Vyew to host live conferences or collaborate over time. Vyew is safe, reliable, and you don’t need to configure anything. All you need is a web browser (IE 6+, Firefox, or Safari). LongJump is a dynamic business applications that manage and coordinate teams and information. The LongJump Catalog provides affordable, web-based applications you can subscribe to that power your business. It makes it easy to centralize your business data to share with your team, while also automating common business processes. Customize or create your own applications that address your unique business needs without writing a single line of code. Business IT Online offers free online small business software applications that take away the need for a costly networked IT solution. It provides the host, maintain it, upgrade it, secure it and back it up so all you need to do is use it. Among the applications are the following: calendar online, cash flow, contacts online, documents online, marketing online. Near-Time integrates wikis, weblogs, and file-sharing to deliver the fastest ROI for your collaboration investments. Mindquarry is an Open Source collaborative software platform for file sharing (documents, images, media files, etc. ), task and project management, team collaboration and Wiki editing that meshes simplicity and functionality. As a result, knowledge workers are able to connect with team members and share information from wherever they are, effectively improving team-work and increasing productivity within the company. Nexo is a free service that allows groups to collaborate online. Groups can share interactive calendars, pictures, videos, tasks, polls, comments, blogs, files and much more. Copper is a web-based project management and collaboration tool used by teams to share and manage clients, projects, tasks, files, contacts and events quickly and easily. Used by leading organizations like Apple, Cisco, Praystation, and Ogilvy One, yet affordable for all business sizes, discover how Copper can help your business by signing up for your free trial. Thinkature is a real-time collaboration application for the web. Use it to record ideas on cards, show relations with connectors, draw diagrams to express complex ideas, add images from the web or from your own hard drive. You can separate ideas by color and more. PlanHQ.com is an online business planning tool that takes your plan away from being a static document and turns it into a dynamic and up-to-date overview of where you’ve been, where you are and where you’re going. With PlanHQ, your business plan changes as your business changes, not just once or twice a year. Your whole team is actively involved in creating your plan and can align and prioritize all their work against goals. This means that everyone is always working to plan and ensures you achieve your goals. OpenTeams.com is web-hosted collaborative software to foster a more innovative culture. In addition to project collaboration, blogging, social networking, community building, and knowledge management, OpenTeams is an innovative initiative development solution where employees collaboratively seed and mature new ideas for additional revenue, productivity, and cost-savings. TeamWorkLive is an intuitive, secure, web-based project management and collaboration tool. It helps you run your projects more efficiently, promotes collaboration and accountability among team members, and makes your clients happier through increased transparency. TeamWork Live is hosted so there is no software to install or support. All you need to get started is a web browser and an Internet connection. Foldera is a free and intuitive filing system of web-based folders that automatically organizes your work WHILE you work. Whether you work alone or in a workgroup environment, Foldera is super easy to use and makes working with multiple files and people seem practically effortless. Huddle is a network of secure online spaces that combine powerful document, project and team tools with the simplicity of social networking site. It is ideal for brands, advertising, marketing, PR, design, legal and accountancy companies as well as freelancers and consultants. Use huddle to manage multiple projects from one interface, securely share and approve documents, deliver superior client service and add value to your existing relationships. ProjectSpaces is a simple, secure and powerful web-based workspace to help your project teams, workgroups, committees, partners, and others quickly and easily connect, share and collaborate. ProjectSpaces is easy to use and can be set up in just a few minutes. It was created for the average computer user – not techno geeks. You can share documents with project team members regardless of geographic constraints. At one glance, view and access your most recent tasks, announcements, events and discussions on your project homepage. Participants have the ability to directly update status of their tasks and other information. Contact Office allows to easily manage your data (emails, contacts, meetings, documents, tasks, …) in your virtual office from any computer with a Web browser and an Internet connection. Share your data and access shared data efficiently in the context of work or leisure groups. Your data are safe and available anytime on the Web, on a PDA (online or offline) or on a WAP capable cell phone. Text Messaging/VoIP/Webcams, archiving, administrative tools, and more. Eloops software includes project management, calendar, data backup, and social networking software. Writewith is a web-based software application designed for anyone who needs to work on a document with anyone else. Writewith.com can be used for office memos, group projects, news stories or even drafting a letter with a friend. Every article you do is unique, useful and presented in a very nice fashion. Thanks for doing what you do and please keep on doing what you do! This is a very valuable list; I am now involved in actively seeking a collaboration tool in my rapidly-growing business. I have spent a lot of time reviewing many of the sites suggested here and a bunch of others, too, and below are my top picks, based on ease of use, and overall operability. Opensource solutions are appealing but most require a mechanic to get them on the road and I don’t want to get bogged down with that. which is a Web 2.0 add-on tool. It enables one to put a collaborative space onto any webpage.Through TeemingPod one can ask polling questions, carry on threaded discussions, ask and answer questions and show links and search terms (tag clouds). I find it very useful to engage my readers and users with my web-content. When used among closed groups it might prove to be a good social and business collaboration tool which makes interaction easier and faster. We use DeskAway for social project collaboration. Its working really well with our internal and clients. I’d like to recommend cyn.in – an open source collaboration software for the enterprise. we have been using it for a while in our company and it has really benefited our internal collaboration. Do add it to your list here. Thanks for the useful information on audio and conferencing stuff. Liked your site and will bookmark it for future. Very comprehensive list indeed. Of course a list like this can never be exhaustive, but one that you may be interested in checking out is http://www.eazybusiness.com which offers business tools for collaboration, crm, hrm, cms, etc. This is a great list. I would like to add a tool for Sales and Marketing Professionals that need to collaborate with prospects/clients/partners. The tool is the business collaboration network by DRE Software (www.dresoftware.com). You can try it for free.